UNITED NATIONS, November 27 -- "The Security Council members are a bunch of wilting daisies." This is the sanitized version of an insult delivered at 1 a.m. in the basement of the UN, where the budgetary Fifth Committee met late into Tuesday night amid a fog of tobacco smoke and bonhomie. "This is the center of the universe," one participant told Inner City Press outside the meeting room. "Calling Condi Rice won't effect this -- these are countries' experts, debating the budgets until dawn." Welcome to the boiler room of the UN system: the General Assembly's Fifth Committee, which miraculously debates and approves budgets -- by consensus no less -- in the wee hours of the morning. On the night of November 27, the topic was the Capital Master Plan, the proposal to gut renovate the UN Headquarters building. At 1 a.m., Inner City Press asked the CMP's new chief Michael Adlerstein what his jaunty smile meant. "Interpret it," he said. "Were you the Officer in Charge of the Department of Management over Thanksgiving?" Alderstein laughed, then conferred with the 5th Committee's secretary. 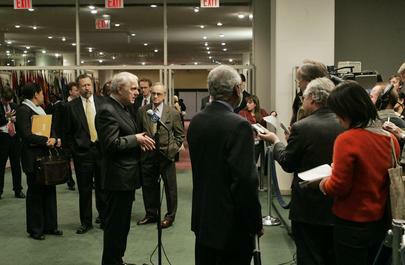 Too many of the 5th Committee's meeting are in secret, for this journalist's tastes. But it has been explained: since 1986, decisions have had to be made by consensus. Absurd as it sounds, this gives each of over 190 countries the veto power which in the Security Council is reserved to five Cold War powers. The mystery of most interest to Inner City Press at the moment is the Darfur hybrid force budget, with the $250 million no-bid contract to Lockheed Martin bundled in. The only reason it might be accepted, it seems, is that no one wants to slow the mission. It's like Bush facing down the U.S. Congress on funding for Iraq: who dares starve the soldiers? "The best defense for corruption," said one wag, "is to accuse its accusers of defending genocide." Will the Fifth Committee cut through the fog? Will they demand real answers to the questions asked last week? Will any of it be made public? That will be important. Watch this site. We finally report, because apparently no one else did, that in an election on November 16, American Susan M. McLurg was elected chairperson of the UN's Advisory Committee on Administrative and Budgetary Questions. In the UN's current blue liaison book, Ms. McLurg is listed as a member of the U.S. permanent mission. As chairperson, she will receive a salary from the UN. The other ACABQ members, if not associated with a mission, are said to receive "Daily Sustenance Allowance." All are supposed to be independent, even if in a nation's pay. "As regards the conduct of member states during voting -- Please note that there is a rule that makes reference to this, it is rule 88 of the Rules of Procedure of the GA which notes that 'after the President has announced the beginning of voting, no representative shall interrupt the voting except on a point of order in connection with the actual conduct of the voting.' In other words, it is up to the member states themselves to challenge the conduct of the voting in accordance with this rule." Inner City Press: you said in the Fifth Committee... they're going to continue with this deliberation on the UNAMID budget? Inner City Press: ...for information and response. I think it's a hundred and some questions, is the way the Department of Peacekeeping Operations counted it... some Member States asked that the responses be public, be in a formal setting... Has a decision been made on that and when will we know that the responses have been given? GA Spokesperson: Matthew, you asked that on Wednesday and I did mention to you at that time that, as we have said, with the Assembly, with the various different committees, that as far as the rules and procedures are concerned, basically the Committees are the masters of their own procedures. So it's up to Member States to decide whether they want to switch from an informal consultation into an open debate. Now I also mentioned, at that time, that the Fifth Committee is a unique Committee in the sense that -- and these were the words I used -- tends to like to want to take decisions on a consensual basis. So that's what you would be looking for. If there's a consensus amongst the members of the Fifth Committee to have an open debate, then I see no reason why not. But so far, the way the Fifth Committee operates is you have an open discussion, introduction of a particular item, and then the Committee switches into informal consultations on that same topic. It�s a back and forth with the M ember States and the Secretariat. Then once all the issues have been satisfied and the members of the Committee have all the information they need, on that particular subject, in this case let�s say the UNAMID budget, then they go, with the help of the coordinator for that particular item, and start working on a draft resolution. And that�s where the coordinator�s role comes in, etc. And that's why you have continuously more consultations. GA Spokesperson: I think if they do decide, we would know in time. We'll see. Further out, it is said that within the Group of 77 there is consideration of a resolution which would require General Assembly approval of nominations for Under and even Assistant Secretary-General posts. This would be a way for the GA to have more input. But there are some Ambassadors in the G-77 who are themselves hoping to quietly get ASG or even USG posts, and they don't want further scrutiny. But scrutiny is needed and, in surprising lowly quarters, welcomed. Watch this site.